"GRU" redirects here. For other uses, see GRU (disambiguation). This article is about the Russian G.U.. For the Soviet Union's GRU, see Main Intelligence Directorate (GRU). The Main Directorate of the General Staff of the Armed Forces of the Russian Federation (Russian: Гла́вное управле́ние Генера́льного шта́ба Вооружённых Сил Росси́йской Федера́ции), abbreviated G.U., formerly the Main Intelligence Directorate (Russian: Гла́вное разве́дывательное управле́ние, tr. Glavnoye razvedyvatel'noye upravleniye, IPA: [ˈɡlavnəjə rɐzˈvʲɛdɨvətʲɪlʲnəjə ʊprɐˈvlʲenʲɪjə]) and still commonly known by its previous abbreviation GRU (Russian: ГРУ, IPA: [ɡeeˈru]), is the foreign military intelligence agency of the General Staff of the Armed Forces of the Russian Federation (formerly the USSR′s General Staff). Unlike Russia's other security and intelligence agencies, such as the SVR, the FSB, and the FSO, whose heads report directly to the president of Russia, Director of GRU is subordinate to the Russian military command, i.e. the minister of defence and the Chief of the General Staff. Until 2010, and again from 2013, the GRU combined a military intelligence service and special forces. The Directorate is reputedly Russia's largest foreign intelligence agency. According to unverified statements by GRU defector Stanislav Lunev, in 1997 the agency deployed six times as many agents in foreign countries as the SVR, the successor of the KGB's foreign operations directorate (PGU KGB). It also commanded 25,000 Spetsnaz troops in 1997. 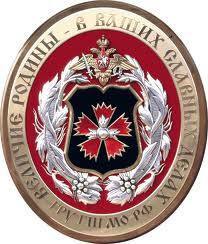 GRU Official emblem (until 2009) with motto engraved: "Greatness of the Motherland in your glorious deeds"
The first Russian body for military intelligence was established in 1810 by the War minister Michael Andreas Barclay de Tolly who suggested to the emperor the creation of a permanent body for Strategic military intelligence. In January 1810, The Expedition for Secret Affairs under the War Ministry was formed. Two years later it was renamed the Special Bureau. In 1815, the bureau became the First Department under the General Chief of Staff. In 1836 the intelligence functions were transferred to the Second Department under the General Chief of Staff. After many name changes through the years, in April 1906 the Military intelligence was carried out by the Fifth Department under the General Chief of Staff of the War Ministry. As originally established, the Registration Department was not directly subordinate to the General Staff (at the time called the Red Army Field Staff – Polevoi Shtab). Administratively, it was the Third Department of the Field Staff's Operations Directorate. In July 1920, the RU was made the second of four main departments in the Operations Directorate. Until 1921, it was usually called the Registrupr (Registration Department). That year, following the Soviet–Polish War, it was elevated in status to become the Second (Intelligence) Directorate of the Red Army Staff, and was thereafter known as the Razvedupr. This probably resulted from its new primary peacetime responsibilities as the main source of foreign intelligence for the Soviet leadership. As part of a major re-organization of the Red Army, sometime in 1925 or 1926 the RU (then Razvedyvatelnoe Upravlenye) became the Fourth (Intelligence) Directorate of the Red Army Staff, and was thereafter also known simply as the "Fourth Department." Throughout most of the interwar period, the men and women who worked for Red Army Intelligence called it either the Fourth Department, the Intelligence Service, the Razvedupr, or the RU. […] As a result of the re-organization [in 1926], carried out in part to break up Trotsky's hold on the army, the Fourth Department seems to have been placed directly under the control of the State Defense Council (Gosudarstvennaia komissiia oborony, or GKO), the successor of the RVSR. Thereafter its analysis and reports went directly to the GKO and the Politburo, apparently even bypassing the Red Army Staff. The GRU was given the task of handling all military intelligence, particularly the collection of intelligence of military or political significance from sources outside the Soviet Union. The GRU operated residencies all over the world, along with the SIGINT (signals intelligence) station in Lourdes, Cuba, and throughout the former Soviet-bloc countries, especially in Lithuania, Latvia, and Estonia. The first head of the 4th Directorate was Janis Berzin, a Latvian Communist and former member of the Cheka, who remained in the post until 28 November 1937, when he was arrested and subsequently executed during the Great Purge. The GRU was known in the Soviet government for its fierce independence from the rival "internal intelligence organizations", such as the NKVD and KGB. Nonetheless, the Cheka infiltrated the GRU in 1919. That worsened a fierce rivalry between the two agencies, which were both engaged in espionage and was even more intense than the rivalry between the Federal Bureau of Investigation and Central Intelligence Agency in the US. The existence of the GRU was not publicized during the Soviet era, but documents concerning it became available in the West in the late 1920s, and it was mentioned in the 1931 memoirs of the first OGPU defector, Georges Agabekov, and described in detail in the 1939 autobiography (I Was Stalin's Agent) by Walter Krivitsky, the most senior Red Army intelligence officer ever to defect. It became widely known in Russia, and the West outside the narrow confines of the intelligence community, during perestroika, in part thanks to the writings of "Viktor Suvorov" (Vladimir Rezun), a GRU officer who defected to Great Britain in 1978, and wrote about his experiences in the Soviet military and intelligence services. According to Suvorov, even the General Secretary of the Communist Party of the Soviet Union, to enter GRU headquarters, needed to go through a security screening. Following the dissolution of the USSR in December 1991, the GRU continued as an important part of Russia's intelligence services, especially since it was never split up, unlike the KGB. The KGB was dissolved after aiding a failed coup in 1991 against the then Soviet President Mikhail Gorbachev. It has since been divided into the Foreign Intelligence Service (SVR) and the Federal Security Service (FSB). In 2006, the GRU moved to a new Headquarters complex at Khoroshovskoye Shosse, which cost 9.5 billion rubles to build and incorporates 70,000 square meters. In April 2009, President Dmitry Medvedev fired then-GRU head Valentin Korabelnikov, who had headed the GRU since 1997, reportedly over Korabelnikov's objections to proposed reforms. In 2010, the official name of the unit was changed from "GRU" to the" Main Directorate of the Russian General Chief of Staff", or "G.U. ", but "GRU" continued to be commonly used in media. The GRU chief Igor Sergun′s death in early January 2016 caused speculations of foul play. At the helm of the GRU since late 2011, Igor Sergun was reported to have taken charge of the agency in the wake of the drastic cuts to the service implemented in the course of radical reorganization of the military at the hands of Defence Minister Anatoliy Serdyukov, and was credited with the GRU having recovered some of its former influence, most notably by playing a prominent role in the capture of Crimea in 2014 and the Russian intervention in eastern Ukraine after an FSB-orchestrated pro-Russian unrest largely fizzled out. The tenure of Sergun′s successor, Igor Korobov, was marked by what was construed by the news media as multiple high-profile failures such as the thwarted 2016 coup d'état attempt in Montenegro and the failed 2018 Salisbury poisoning, as well as an unprecedented number of disclosed GRU agents. Korobov died on 21 November 2018, "after a serious and prolonged illness", according to the official defence ministry′s statement. His death provoked speculations and unverified reports of him having fallen ill in October that year, following a harsh dressing-down from president Vladimir Putin. However, former CIA station chief Daniel Hoffman, cautioned in 2017 that some of the Russian intelligence′s recent operations that appeared to be botched might have been ″discoverable influence operations″, i.e. operations that were meant to be discovered. The GRU is organized into numerous directorates. The First Directorate is responsible for intelligence in Europe. The Second Directorate is geographically responsible for the Western Hemisphere. The Third Directorate has a geographic responsibility for Asia. The Fourth Directorate is geographically responsible for Africa and the Middle East. The Fifth Directorate is responsible for military operations intelligence, including naval intelligence. The GRU's Sixth Directorate is responsible for signals intelligence (SIGINT). Unit 54777, alternately called the 72nd Special Service Center, is one of the GRU's primary psychological warfare capabilities. Unit 54777 retains several front organizations, including InfoRos and the Institute of the Russian Diaspora. Since the mid-1970s the GRU has maintained a satellite communications interception post near Andreyevka, located approximately fifty miles from Spassk-Dalny, Primorsky Krai. According to a Western assessment of the GRU seen by Reuters in the autumn of 2018, the GRU had a long-running program to run ‘illegal’ spies, i.e. those who work without diplomatic cover and who live under an assumed identity in foreign countries for years. The assessment said: “It plays an increasingly important role in Russia’s development of Information Warfare (both defensive and offensive). It is an aggressive and well-funded organization which has the direct support of – and access to – [Russian President Vladimir] Putin, allowing freedom in its activities and leniency with regards to diplomatic and legislative scrutiny." Commonly known as the Spetsnaz GRU, it was formed in 1949. Following the dissolution of the Soviet Union in 1991, the Spetsnaz GRU remained intact as part of the Russian GRU until 2010, when it was reassigned to other agencies. In 2013, however, the decision was reversed and Spetsnaz GRU units were reassigned to GRU divisions and placed under GRU authority again. GRU officers train at a Ministry of Defence military academy at 50 Narodnoe Opolchenie Street, with intelligence agents receiving additional training at the Cherepovets Higher Military School of Radio Electronics. The A.F. Mozhaysky Military-Space Academy has also been used to train GRU officers. According to the Federation of American Scientists: "Though sometimes compared to the US Defense Intelligence Agency, [the GRU's] activities encompass those performed by nearly all joint US military intelligence agencies as well as other national US organizations. The GRU gathers human intelligence through military attaches and foreign agents. It also maintains significant signals intelligence (SIGINT) and imagery reconnaissance (IMINT) and satellite imagery capabilities." Soviet GRU Space Intelligence Directorate had put more than 130 SIGINT satellites into orbit. GRU and KGB SIGINT network employed about 350,000 specialists. On 9 November 2018, Austrian Chancellor Sebastian Kurz said that a 70-year-old retired army colonel was believed to have spied for Russia for years. The officer in question, whose name was not disclosed, was reported to have been engaged in selling official secrets to his GRU handlers from 1992 until September 2018. An investigation by Bellingcat and Capital identified GRU officer Denis Vyacheslavovich Sergeev (using the alias Sergey Vyacheslavovich Fedotov) as a suspect in the 2015 poisoning of Bulgarian businessman Emilian Gebrev in Sofia, following an attack that mirrored the techniques used in the poisoning of Sergei and Yulia Skripal. The GRU received intelligence from Jeffrey Delisle of the Royal Canadian Navy, leading to the expulsion of several Russian Embassy staffers, including the defence attaché to Ottawa. A Russian citizen named Artem Zinchenko was convicted of spying on Estonia for GRU in May 2017. On September 5, 2018, Estonian Army Major Deniss Metsavas and his father, Pjotr Volin, were charged with giving classified information to the GRU since 2013. In September 2018 Finnish police ran a large scale operation against numerous sites owned by Airiston Helmi Oy company that over years accumulated land plots and buildings close to nationally significant key straits, ports, oil refineries and other strategic locations as well as two Finnish Navy vessels. The security operation was run in parallel in multiple locations, involving Finnish National Bureau of Investigation, local police, Tax Administration, Border Guard, and Finnish Defence Forces. During the operation a no-fly zone was declared over Turku Archipelago where key objects were located. While official cause given for the raid was multi-million euro money laundering and tax fraud, media speculated that the company might have been a cover for GRU preparing infrastructure for a surprise attack on Finnish locations in case of a conflict situation. GRU operatives belonging to Fancy Bear/APT 28 reportedly used fake Facebook accounts to pose as associates of Emmanuel Macron's campaign staff, with the goal of interfering with the 2017 French presidential election. Georgy Petrovich Roshka, a member of the GRU's Unit 26165 was involved in the theft of Macron's emails, and subsequent distribution via WikiLeaks. Viktor Ilyushin, a GRU operative working as an Air Force deputy attaché, was expelled from France in 2014 for attempted espionage of the staff of François Hollande. In August 2015, a GRU unit posing as Islamic State of Iraq and the Levant supporters called CyberCaliphate took TV5Monde offline for approximately 18 hours. During the 2006 Georgian–Russian espionage controversy, four officers working for the GRU Alexander Savva, Dmitry Kazantsev, Aleksey Zavgorodny and Alexander Baranov were arrested by the Counter-Intelligence Department of the Ministry of Internal Affairs of Georgia and were accused of espionage and sabotage. This spy network was managed from Armenia by GRU Colonel Anatoly Sinitsin. A few days later the arrested officers were handed over to Russia through the Organization for Security and Co-operation in Europe (OSCE). Spetsnaz GRU unit No. 48427, an airborne unit, participated in the Russo-Georgian War. In September 2000, Japan expelled Captain Viktor Bogatenkov, a military attache at the Russian Embassy in Tokyo, on allegations of espionage. Bogatenkov was a GRU agent who received classified information from Shigehiro Hagisaki (萩嵜 繁博), a researcher at the National Institute for Defense Studies. In June 2017, Moldova expelled five Russian GRU operatives with diplomatic cover from the Russian Embassy in Chisinau, as they were believed to be attempting to recruit fighters from Gagauzia to fight in the ongoing conflict with Ukraine. Russian Deputy Minister of Foreign Affairs Grigory Karasin rejected the allegations. The two Russian nationals indicted by Montenegrin prosecution as the organisers of the attempted coup d'état in Montenegro in October 2016 are believed to be GRU officers. One of them, Eduard Vadimovich Shishmakov ("Shirokov") had been officially identified as GRU in October 2014, when Shishmakov, who then held the position of a deputy military attache at the Russian embassy in Poland, was declared persona non grata by the Polish government. In mid-September 2018, the Swiss press reported that two men allegedly working for the GRU had been arrested in The Hague, the Netherlands in the spring that year, after the Salisbury poisoning incident, for planning to hack the computer systems of the Spiez Laboratory, a Swiss institute analyzing chemical weapon attacks for the Organisation for the Prohibition of Chemical Weapons (OPCW). In early October 2018, the government of the Netherlands announced they had arrested four GRU operatives on 13 April: the Russians allegedly attempted to launch a major ″close access″ cyberattack against the headquarters of the OPCW in the Hague and also intended to travel onwards to the Spiez laboratory in Switzerland, which was testing Novichok samples from Salisbury at the time. Investigation conducted by open-source intelligence outlets in the aftermath of the Dutch government's revelations that used Russian road police databases led to identification of further 305 GRU officers whose private cars were registered at GRU headquarters in Moscow. On 13 February 2004, in Doha, two Russian men assassinated Zelimkhan Yandarbiyev, an exiled leader of Chechen rebels. Anatoly V. Belashkov and Vasily A. Bogachyov, thought to be GRU members, were found guilty of the murder by a Qatari criminal court, which said the men had acted under direct orders from the Russian leadership. Dmitry Kozak and Vladislav Surkov, members of the Vladimir Putin administration, reportedly served in GRU. Two Chechen former warlords Said-Magomed Kakiev and Sulim Yamadayev are commanders of Special Battalions Vostok and Zapad ("East" and "West") that are controlled by the GRU. The battalions each included close to a thousand fighters until their disbandment in 2008. Approximately 300 commandos, intelligence officers and other GRU personnel died during the fighting in Chechnya. GRU detachments from Chechnya were transferred to Lebanon independently of the United Nations Interim Force in Lebanon after the 2006 Lebanon War. Zelimkhan Yandarbiyev was assassinated by two GRU officers. GRU officers have also been accused of creating criminal death squads. The Sixth Directorate was responsible for maintaining the Center S covert listening post in Syria prior to its loss to the Free Syrian Army in 2014. The Sixth Directorate also operates a signals intelligence listening post at Hmeimim Air Base near Latakia. In 2015, GRU special forces soldiers have reportedly appeared in Aleppo and Homs. GRU officials have also visited Qamishli, near the border with Turkey. In 2018 Turkish government published CCTV videos from assassination of a Chechen commander Abdulvahid Edelgiriev, who was killed in 2015 in Istanbul, claiming the perpetrator was the same person as Anatoliy Chepiga ("Ruslan Boshirov") from Skripal assassination in UK. The GRU Spetsnaz were involved in the annexation of Crimea by the Russian Federation and in the War in Donbass. During the November 2018 Kerch Strait incident, the GRU's Unit 54777 sent text messages to Ukrainian men in the border region calling on them to report for military service. In September 2018, the Crown Prosecution Service formally named two Russian nationals, Alexander Petrov and Ruslan Boshirov (the names used by the men when entering the UK), as suspected perpetrators of the assassination attempt of the former GRU officer Sergei Skripal and his daughter in March 2018. As part of the charge announcement Scotland Yard released a detailed track of the individuals' 48 hours in the UK. This covered their arrival in the UK at Gatwick Airport, trip to Salisbury the day before the attack, trip to Salisbury on the day of the attack and return to Moscow via Heathrow Airport. The two men stayed both nights in the City Stay Hotel on Bow Road, East London and Novichok was found in their room after police sealed it off on 4 May 2018. British Prime Minister Theresa May told the Commons the same day that the suspects were part of the G.U. intelligence service (formerly known as GRU) and the assassination attempt was not a rogue operation and was "almost certainly" approved at a senior level of the Russian state. As a side effect of the Skripal poisoning investigation, Russian and Western media reported conclusions made by open-source intelligence outlets that claimed that GRU operatives were issued Russian foreign travel passports with certain characteristics that would allow their tentative identification. Through further research, in the autumn of 2018, "Boshirov" was publicly exposed as Anatoliy Chepiga, a decorated GRU officer, and "Petrov" as Alexander Mishkin. GRU officer Stanislav Lunev, who defected to the U.S. in 1992 while he was posted in Washington under the cover of a TASS news agency correspondent, in the 1990s publicized his claims that small nuclear weapons that could be fit into a knapsack or a briefcase or suitcase had been secretly pre-positioned in the U.S. and other countries around the world to be used for sabotage by Russia′s agents in the event of war. U.S. Congressman, Curt Weldon, pursued these claims publicly while admitting that they had been found largely spurious by the FBI. Searches of the areas identified by Lunev – who admitted he had never planted any weapons in the US – have been conducted, "but law-enforcement officials have never found such weapons caches, with or without portable nuclear weapons." On 29 December 2016, the White House sanctioned the nine entities and individuals, including the GRU as well as the FSB, for their alleged activities to disrupt and spread disinformation during the 2016 US presidential election. In addition, the United States State Department also declared 35 Russian diplomats and officials persona non grata and denied Russian government officials access to two Russian-owned installations in Maryland and New York. On July 13, 2018, an indictment to several GRU Staffers was issued. GRU Unit 26165 and Unit 74455 are alleged to be behind the DCLeaks website, and were indicted for obtaining access and distributing information from data about 500,000 voters from a state election board website as well as the email accounts of John Podesta, Hillary Clinton, and volunteers and employees of the Unites States Presidential Campaign of Hillary Clinton, the Democratic Congressional Campaign Committee, and the Democratic National Committee (DNC). According to information leaked by Reality Winner, the GRU attempted to hack the voting machine manufacturer VR Systems, as well as local election officials. In July 2018, Deputy Attorney General Rod Rosenstein released an indictment returned by a grand jury charging twelve GRU officers with conspiring to interfere in the 2016 elections. According to Microsoft VP Tom Burt, a GRU-run group dubbed Strontium (alternatively known as APT28, Sofacy, and Pawn Strorm, and Fancy Bear) has been engaged in spear phishing attacks against at least three campaigns in the 2018 midterm elections. The Head of the Russian Military Intelligence is a military officer. He is the primary military intelligence adviser to the Russian Minister of Defense and to the Chief of Staff and also answers to the President of Russia. ^ a b c d "What is Russia's GRU military intelligence agency?". Reuters. 5 Oct 2018. ^ "Reuters Factbox on Russian military intelligence by Dmitry Solovyov". Reuters. Retrieved 15 November 2014. ^ Lunev, Stanislav (12 September 1997). "Changes may be on the way for the Russian security services". PRISM. The Jamestown Foundation. 3 (14). Archived from the original on 25 November 2006. ^ Earl F. Ziemke, Russian Review 60(2001): 130. ^ Leonard, Secret Soldiers of the Revolution, p. 7. ^ Leonard, Secret Soldiers of the Revolution, p.xiv. ^ "Reuters Russia's Medvedev sacks military spy chief by Dmitry Solovyov Fri Apr 24, 2009". Reuters. Retrieved 15 November 2014. ^ "Putin Arrives in Style at Military Spy Base". The Moscow Times. Archived from the original on December 30, 2016. Unlike its predecessor, a drab, redbrick monolith nicknamed the Aquarium, the new GRU complex is a futuristic glass-clad and bulletproof structure that bears more than a passing resemblance to the London headquarters of Britain's MI6 [...] The complex, whose construction began in 2003, cost 9.5 billion rubles ($357 million) to build, and incorporates an area of 70,000 square meters. ^ Young, John (August 10, 2008). "GRU Headquarters - Russian MilIntel Eyeball". Cryptome. Archived from the original on December 30, 2016. ^ Solovyov, Dmitry (April 24, 2009). "Russia's Medvedev sacks military spy chief". Reuters. Archived from the original on December 30, 2016. President Dmitry Medvedev sacked Russia's most powerful intelligence chief Friday in a move that underscores strained ties with some of the military top brass over a Kremlin-backed reform of the armed forces. The Kremlin said Medvedev had signed a decree to dismiss General Valentin Korabelnikov, who has directed Russia's military intelligence service since 1997. ^ "Russia military spy boss 'sacked'". BBC News. April 24, 2009. Archived from the original on December 30, 2016. Gen Korabelnikov had been the head of military intelligence for 12 years and was a four-star general. Analysts say the 63-year-old was one of the main opponents of the planned military reforms, which could see the Russian armed forces shrink from 1.3 million serving men and women to one million. The majority of those cuts would come from the officer corps, which could see the loss of around 200,000 posts, including many generals. Some of the proposed reforms were said to have included the disbanding of several GRU-controlled army special forces (Spetsnaz) brigades and the redistribution of the command of some GRU structures to the SVR. Gen Korabelnikov is reported to have submitted his resignation in protest last November. ^ a b c d e f Turovsky, Daniil (November 6, 2018). "What is the GRU? Who gets recruited to be a spy? Why are they exposed so often? Here are the most important things you should know about Russia's intelligence community". Translated by Rothrock, Kevin. Meduza. ^ Diary, Geopolitical (January 6, 2016). "A Mysterious Death Raises Questions in Russia". Stratfor. Retrieved March 8, 2016. ^ Yalibnan (March 4, 2016). "Russian military intelligence chief killed in secret operation in Lebanon, report". Ya Libnan. Retrieved March 8, 2016. ^ a b "Russian military intelligence head's death causes inevitable speculation: Igor Korobov knew a lot about GRU operations, including poisoning of the Skripals". The Guardian. 22 November 2018. Retrieved 22 November 2018. ^ Умер начальник ГУ ГШ РФ Игорь Коробов tvzvezda.ru, 22 November 2018. ^ "Источник: умер начальник Главного управления Генштаба ВС РФ Игорь Коробов". TASS. 22 November 2018. ^ "Russian military intelligence GRU chief dies after 'serious illness' – MoD". RT. ^ "Head of Russian Skripal-linked GRU spy agency dies". BBC. 22 November 2018. Retrieved 22 November 2018. ^ Igor Korobov, head of Russian spy agency accused over Salisbury attack, dies aged 63 after 'serious illness' The Telegraph, 22 November 2018. ^ Cover Lifted, A CIA Spy Offers His Take On Trump And Russia NPR, 8 August 2017. ^ By Daniel Hoffman. The Russians Were Involved. But It Wasn’t About Collusion. The New York Times, 28 July 2017. ^ Pike, John (26 November 1997). "Organization of the Main Intelligence Administration (GRU) Glavnoye Razvedyvatelnoye Upravlenie (GRU)". Federation of American Scientists. ^ Pike, John (November 27, 1997). "Signals Intelligence Programs and Activities". Federation of American Scientists. Archived from the original on December 30, 2016. The GRU's Sixth Directorate uses over 20 different types of aircraft, a fleet of 60 SIGINT collection vessels, satellites, and ground stations to collect signals intelligence. Together with FAPSI, the GRU operates SIG1NT collection facilities in over 60 diplomatically protected facilities throughout the world. These agencies also operate large ground collection facilities within the territory of the Commonwealth of Independent States, at Cam Rank Bay, Vietnam, and at Lourdes, Cuba. ^ a b c d Troianovski, Anton; Nakashima, Ellen; Harris, Shane (December 28, 2018). "How Russia's military intelligence agency became the covert muscle in Putin's duels with the West". The Washington Post. Archived from the original on December 29, 2018. ^ Aid, Matthew (29 July 2012). "Russia's Andreyevka SIGINT Station". Archived from the original on December 30, 2016. The station is located in the Maritime Province of the Russian Far East near the tiny village of Andreyevka (Google Earth transliterates the name as Andreevka) at the following geographic coordinates: 44-30-30N 133-28-28E. [...] Built during the mid-1970s by the Soviets, a former senior NSA official mentioned it to me in the late 1980s as being "the biggest and baddest of the Sov’s SIGINT stations.“ At the station’s peak during the Cold War, it was jointly manned by several hundred KGB and GRU (Soviet military intelligence) SIGINTers. Today, the station is owned and operated solely by the GRU, and it would appear that the station has not been upgraded with new equipment in quite some time. ^ Aid, Matthew (May 12, 2012). "Soviet Eavesdropping Station Identified". Archived from the original on December 30, 2016. Andreyevka SATCOM Station: 44-30-30N 133-28-28E Some of these stations are still apparently active (the largest of which is the Andreyevka station near Vladivostok), although to what degree they are still working COMSAT targets cannot be determined from imagery available on Google Maps. ^ "What is Russia's GRU military intelligence agency?". Reuters By Guy Faulconbridge. 5 Oct 2018. ^ McDermott, Roger (2 November 2010). "Bat or Mouse? The Strange Case of Reforming Spetsnaz". Jamestown.org. Retrieved 2014-08-19. ^ "Operations of the Main Intelligence Administration (GRU) Glavnoye Razvedyvatelnoye Upravlenie - Russia / Soviet Intelligence Agencies". Federation of American Scientists. Retrieved 15 November 2014. ^ Austrian court orders release of suspected Russian spy pending trial Reuters, 13 November 2018. ^ A Kremlin Spy Mystery in Vienna Shakes the World Capital of Espionage Observer, 13 November 2018. ^ Austrian colonel spied for Moscow for decades, says Vienna: If true it ‘will not improve the relationship between Russia and EU,’ says Kurz. politico.eu, 9 November 2018. ^ Bellingcat Investigation Team (February 7, 2019). "Third Skripal Suspect Linked to 2015 Bulgaria Poisoning". Bellingcat. ^ "Отрова, оръжия, или войната за "Дунарит"" (in Bulgarian). Capital. January 25, 2019. ^ Rakuszitzky, Moritz. "Third Suspect in Skripal Poisoning Identified as Denis Sergeev, High-Ranking GRU Officer". Bellingcat. ^ Bellingcat Investigation Team (February 21, 2019). "The Search for Denis Sergeev: Photographing a Ghost". Bellingcat. ^ Payton, Laura (20 January 2012). "Spying mystery deepens with lack of information". CBC News. Archived from the original on 30 December 2016. Initial media reports said up to four Russian Embassy staff had been removed from a list of embassy and diplomatic staff recognized by Canada. CBC News has confirmed that two have had their credentials revoked since news broke of the naval officer's arrest, while two diplomats left the country a month or more before the arrest this week of Canadian Sub.-Lt. Jeffrey Paul Delisle. ^ "Estonia Sentences Russian Spy to Five Years in Prison". The Moscow Times. 8 May 2017. Archived from the original on 13 May 2017. Retrieved 13 May 2017. Zinchenko has lived in Estonia on a residence permit since 2013. The Estonian court determined that he was recruited by Russia’s Main Intelligence Directorate (GRU) in 2009, and spent the next four years collecting information about troop movements in Estonia, and about objects of national importance. [...] Zinchenko reportedly passed sensitive information to members of the GRU on multiple occasions, both by means of special communication and in person, on visits to St. Petersburg. ^ Jones, Bruce (9 May 2017). "Tallinn jails GRU agent spying on Estonian and NATO forces". Jane's Information Group. Retrieved 13 May 2017. Artem Zinchenko, a Russian citizen legally resident in Estonia since 2013, was convicted on 8 May of espionage for Russia's GRU military intelligence organisation. Recruited in 2009 and arrested in January 2017, Zinchenko was sentenced to five years for spying on locations, equipment, and manoeuvres of Estonian and NATO forces and critical infrastructure. ^ "Estonia Arrests Army Officer, His Father On Suspicion Of Spying For Russia". Radio Free Europe/Radio Liberty. September 5, 2018. ^ Ferris-Rotman, Amie; Nakashima, Ellen (1 November 2018). "Estonia knows a lot about battling Russian spies, and the West is paying attention". The Washington Post. ^ "A Dawn Raid in the Archipelago". Corporal Frisk. 2018-09-22. Retrieved 2018-09-24. ^ "Масштабная полицейская операция в Финляндии: ниточки неожиданно привели в связанную с эстонцами фирму". Rus.Postimees.ee (in Russian). Retrieved 2018-09-24. ^ Menn, Joseph (27 July 2017). "Exclusive: Russia used Facebook to try to spy on Macron campaign - sources". Reuters. Archived from the original on 27 July 2017. Retrieved 3 August 2017. ^ "Investigative Report: On The Trail Of The 12 Indicted Russian Intelligence Officers". Translated by Coalson, Robert. Radio Free Europe/Radio Liberty. 19 July 2018. ^ Petriashvili, Diana (28 September 2006). "Tbilisi Claims Russian Troop Movements in Response to Spy Dispute". EurasiaNet. Archived from the original on 30 December 2016. A Tbilisi city court September 29 ordered two Russian officers arrested in the Georgian capital, Dmitri Kazantsyev and Alexander Savva, and seven Georgian citizens to be held in pre-trial detention. The Russian consul in Georgia, Valeri Vasiliyev, told Rustavi-2 television that a lawyer for the officers had not been allowed into the courtroom. The Georgian Interior Ministry did not immediately comment on the allegation. The court also passed the same ruling for Konstantin Pichugin, who has been accused of espionage, but who is believed to be inside Russia's regional military headquarters, which remained surrounded by police for a second day. Moscow has refused to surrender Pichugin. ^ "Georgia Arrests Russian 'Intelligence Operatives'". Civil Georgia. 27 September 2006. Archived from the original on 30 December 2016. Georgia's counter-intelligence service arrested four Russian military intelligence (GRU - Glavnoye Razvedovatelnoye Upravlenie) officers and eleven citizens of Georgia who were cooperating with Russian intelligence services, Georgian Interior Minister Vano Merabishvili said on September 27 [...] He said that two Russian intelligence operatives were arrested in Tbilisi - GRU colonel Alexander Sava, who was allegedly the chief of the group operating in Georgia, and Dimitri Kazantsev. Two others - Alexander Zavgorodny and Alexander Baranov - were arrested in Batumi, the Georgian Interior Minister said. ^ Rakuszitzky, Moritz; Romein, Daniel; Dobrokhotov, Roman (November 22, 2018). "Second GRU Officer Indicted in Montenegro Coup Unmasked". bellingcat. ^ a b "Diplomat in spy scandal leaves Japan". The Japan Times. 10 September 2000. ^ "Officer admits giving secrets to Russian spy". The Japan Times. November 28, 2000. Hagisaki told the Tokyo District Court that he handed the MSDF documents to Viktor Bogatenkov, 44, in violation of the SDF Law. Bogatenkov, who reportedly is an agent of the Russian intelligence agency GRU, was with Hagisaki when he was arrested but refused to submit to questioning and returned to Moscow two days later. ^ a b Williams, Matthias (June 13, 2017). Char, Pravin (ed.). "Exclusive: Russian diplomats expelled from Moldova recruited fighters - sources". Reuters. ^ Reuters (13 June 2017). Osborn, Andrew (ed.). "Russia Says Report Its Moldova Diplomats Recruited Fighters Is 'Gossip': RIA". The New York Times. Retrieved 14 June 2017. Allegations that five Russian diplomats expelled from Moldova last month recruited fighters for the Moscow-backed separatists in Ukraine were "idle gossip", the RIA news agency quoted a deputy Russian foreign minister as saying on Tuesday. Grigory Karasin made the comment shortly after Reuters published an exclusive report citing Moldovan government and diplomatic sources as saying that the five were ejected because of their alleged activities as undercover officers with the Russian military intelligence agency, the GRU. ^ a b Russia 'linked' to election-day coup plot in Montenegro Sky News, 21 February 2017. ^ Indictment tells murky Montenegrin coup tale: Trial will hear claims of Russian involvement in plans to assassinate prime minister and stop Balkan country’s NATO membership. Politico, 23 May 2017. ^ Investigation Uncovers Second Russian Montenegro Coup Suspect BalkanInsight, 22 November 2018. ^ Bellingcat раскрыла имя сотрудника ГРУ, подозреваемого в подготовке госпереворота в Черногории NEWSru, 22 November 2018. ^ Montenegro Coup Suspect ‘Was Russian Spy in Poland’: A Russian suspected by Montenegro of masterminding the recent alleged coup attempt was a military officer who was expelled from Poland amid an espionage scandal in 2014, a Polish diplomat told BIRN. BalkanInsight, 21 February 2017. ^ Russian passport leak after Salisbury may reveal spy methods The Guardian, 23 September 2018. ^ Haynes, Danielle; Sakelaris, Nicholas (14 September 2018). "Netherlands expels Russians for hacking lab investigating Skripal case". UPI. ^ Boffey, Daniel; Wintour, Patrick; Roth, Andrew (14 September 2018). "Dutch expelled Russians over alleged novichok lab hacking plot". The Guardian. The Swiss daily newspaper Tages-Anzeiger reported that the men were carrying equipment that could be used to break into the Spiez laboratory’s IT network when they were seized. ^ "Dutch security services expel Russian spies over plot targeting chemical weapons watchdog". The Guardian. 2018-10-04. ^ Netherlands Defence Intelligence and Security Service disrupts Russian cyber operation targeting OPCW government.nl, 4 October 2018. ^ "305 Car Registrations May Point to Massive GRU Security Breach - bellingcat". bellingcat. 2018-10-04. Retrieved 2018-10-04. ^ a b Myters, Steven Lee (July 1, 2004). "Qatar Court Convicts 2 Russians in Top Chechen's Death". The New York Times. ^ Parfitt, Tom (27 June 2004). "Widow refuses to show mercy to Russians on trial for Chechen leader's killing". The Daily Telegraph. ^ Harding, Luke (1 September 2010). "Mystery over Russian general found dead on Turkish beach". The Guardian. ^ Walsh, Nick Paton (June 13, 2006). "Land of the warlords". The Guardian. Archived from the original on December 30, 2016. Sulim Yamadayev: heads 1000 strong East battalion, controlled by the chief intelligence directorate (GRU) of the Russian military. Dislikes Kadyrov [...] Said Magomed Kakiev: commander of 900-strong "West" battalion, also under GRU control. Dislikes Kadyrov. ^ "Spies Still Everywhere, GRU Says". The Moscow Times. July 17, 2003. Archived from the original on December 30, 2016. GRU commando units operate in the armed forces to provide field intelligence and carry out special operations, such as the penetration and elimination of enemy units. The military actively employs GRU commandoes in Chechnya, where they have proven to be about the most able of all military units. More than 300 commandos, intelligence officers and other GRU personnel have died in fighting in Chechnya, Korabelnikov said. ^ McGregor, Andrew (26 October 2006). "Chechen Troops Accompany Russian Soldiers in Lebanon". Jamestown Foundation. Archived from the original on December 30, 2016. In a surprise move, the Russian Defense Ministry assigned security responsibility for its team of military engineers in Lebanon to two detachments of Chechen troops [...] The East and West battalions of Chechen troops are controlled by the Russian military intelligence (GRU) and do not report directly to the Chechen government. ^ Weiss, Michael (September 1, 2016). "Russia Puts Boots on the Ground in Syria". The Daily Caller. Archived from the original on 2 September 2015. In October 2014, the Free Syrian Army sacked a Russian listening post in Tel al-Hara, south of the Quneitra border crossing with Israel. Its location was key. A YouTube video showed a Syrian officer giving the rebels a guided tour of the office building attached to the facility. Documents hanging on the wall, in both Arabic and Russian, including the symbols for Syrian intelligence and 6th Directorate of Russia’s military intelligence agency (GRU), and photos showed spies from both countries hard at work deciphering intercepts. Maps displayed rebel positions; they also showed coordinates of Israel Defense Force units. ^ Fitsanakis, Joseph (9 October 2014). "Secret Russian spy base in Syria seized by Western-backed rebels". intelNews. Archived from the original on 11 October 2014. At some point in the video, the seal of Syrian intelligence is clearly visible, placed next to the seal of the GRU’s 6th Directorate, the branch of Russian military intelligence that is tasked with collecting signals intelligence (SIGINT). ^ Oryx (6 October 2014). "Captured Russian Spy Facility Reveals the Extent of Russian Aid to the Assad Regime". bellingcat. Archived from the original on 9 April 2015. The Russian operator of Center S was the Osnaz GRU, responsible for radio electronic intelligence within Russia’s Armed Forces. Although not much is known about this unit, its logos can be seen below. “Части особого назначения” – Osnaz GRU and “Военная радиоэлектронная разведка” – Military Radio Electronic Intelligence. ^ Matthews, Owen. "Erdogan and Putin: Strongmen in love". Newsweek. Archived from the original on 30 December 2016. The electronic intelligence was gathered, according to the report, by a Russian listening station at Hmemim Airport near Latakia, Syria, operated by the Sixth Directorate of GRu military intelligence. ^ Tsvetkova, Maria (November 5, 2015). "New photos suggest Russia's operation in Syria stretches well beyond its air campaign". Business Insider. Archived from the original on December 30, 2016. CIT also published screenshots from the Instagram page of Ilya Gorelykh, who it said had served in Russia's GRU special forces in the past [...] In late October it showed he had uploaded pictures from Aleppo, one of which showed him holding an assault rifle while wearing civilian clothes. Another image of him posing in camouflage with three other armed men was apparently taken in Homs. ^ "Beyond the airstrikes: Russia's activities on the ground in Syria". November 8, 2015. Archived from the original on December 30, 2016. We believe that Russia's operation in Syria is a "hybrid war", not unlike the one seen in Ukraine. Apart from the airstrikes, Russia provides Assad forces with surface-to-surface rocket systems, combat vehicles, equipment, advisors, artillery support and spotters. More importantly, recently there have been more and more reports of Russian soldiers, vehicles and "volunteers" being spotted close to the frontlines. ^ Agence France-Presse (22 January 2016). "Turkey alarmed by 'Russian build-up' on Syria border". The National. Archived from the original on 30 December 2016. Top Russian military officials, including figures from the GRU military intelligence service, had already visited Qamishli, it added. ^ "Have Russian hitmen been killing with impunity in Turkey?". BBC News. 2016-12-13. Retrieved 2018-10-04. ^ "Çeçen Komutanı Türkiye'de öldürmüşlerdi". www.haberturk.com (in Turkish). Retrieved 2018-10-04. ^ a b "Salisbury Novichok poisoning: Two Russian nationals named as suspects". BBC News. 5 September 2018. Retrieved 5 September 2018. ^ "Novichok suspects – the 48-hour mission to kill caught on camera". BT News. 5 September 2018. Retrieved 5 September 2018. ^ "Salisbury Novichok poisoning: Russian 'hit men' charged over nerve agent attack". The Evening Standard. 5 September 2018. Retrieved 5 September 2018. ^ "Guests of two-star London hotel where Salisbury suspects stayed discover Novichok was found in bedroom". The Telegraph. Retrieved 5 September 2018. ^ "Russia's GRU: The murky spy agency behind the Salisbury poisoning, a failed coup and US election hack". The Telegraph. Retrieved 5 September 2018. ^ "Skripal Suspects Confirmed as GRU Operatives: Prior European Operations Disclosed - bellingcat". bellingcat. 2018-09-20. Retrieved 2018-09-24. ^ "Skripal Suspect Boshirov Identified as GRU Colonel Anatoliy Chepiga - bellingcat". bellingcat. 2018-09-26. Retrieved 2018-10-04. ^ "Anatoliy Chepiga Is a Hero of Russia: The Writing Is on the Wall - bellingcat". bellingcat. 2018-10-02. Retrieved 2018-10-04. ^ "Salisbury novichok suspect 'helped Ukraine's deposed president flee country'". The Independent. Retrieved 2018-10-04. ^ "Second Skripal Poisoning Suspect Identified as Dr. Alexander Mishkin". Bellingcat. 8 October 2018. Retrieved 9 October 2018. ^ "Full report: Skripal Poisoning Suspect Dr. Alexander Mishkin, Hero of Russia". Bellingcat. 9 October 2018. Retrieved 9 October 2018. ^ a b Stanislav Lunev (1998). Through the Eyes of the Enemy: The Autobiography of Stanislav Lunev. Regnery Publishing, Inc. ISBN 0-89526-390-4. ^ a b "FACT SHEET: Actions in Response to Russian Malicious Cyber Activity and Harassment". White House. Retrieved 31 December 2016. ^ Sullivan, Eileen; Benner, Katie (13 July 2018). "12 Russian Agents Indicted in Mueller Investigation". New York Times. Retrieved 13 July 2018. ^ "United States of America vs. Viktor Borisovich Netyksho, Boris Alekseyevich Antonov, Dmitriy Sergeyevich Badin, Ivan Sergeyevich Yermakov, Aleksey Viktorovich Lukashev, Sergey Aleksandrovich Morgachev, Nikolay Yuryevich Kozachek, Pavel Vyacheslavovich Yershov, Artem Andreyevich Malyshev, Aleksandr Vladimirovich Osadchuk, Aleksey Aleksandrovich Potemkin, and Anatoliy Sergeyevich Kovalev" (PDF). New York Times. United States District Court for the District of Columbia. July 13, 2018. Retrieved 13 July 2018. ^ Lee, Micah (18 July 2018). "What Mueller's Latest Indictment Reveals About Russian and U.S. Spycraft". The Intercept. ^ Deputy Attorney General Rod J. Rosenstein Delivers Remarks Announcing the Indictment of Twelve Russian Intelligence Officers for Conspiring to Interfere in the 2016 Presidential Election Through Computer Hacking and Related Offenses The U.S. Department of Justice, 13 July 2018. ^ Wilkie, Christina (July 13, 2018). "5 key takeaways from the latest indictment in Mueller's Russia probe". Retrieved July 30, 2018. ^ "12 Russian Agents Indicted in Mueller Investigation". NY Times. 13 July 2018. Retrieved 6 August 2018. ^ Poulsen, Kevin (20 July 2017). "Putin's Hackers Now Under Attack—From Microsoft". The Daily Beast. Also known as APT28, Sofacy, Pawn Strorm and Strontium—Microsoft’s preferred moniker—Fancy Bear has been conducting cyber espionage since at least 2007, breaching NATO, Obama’s White House, a French television station, the World Anti-Doping Agency and countless NGOs, and militaries and civilian agencies in Europe, Central Asia and the Caucasus. ^ Collier, Kevin (20 July 2018). "The Russians Who Hacked The DNC Have Targeted At Least Three 2018 Campaigns, Microsoft Says". BuzzFeed News. Speaking on a panel at the Aspen Security Forum on Thursday, Tom Burt, Microsoft's vice president for customer security and trust, said that his team had discovered a spear-phishing campaign targeting three candidates running for election in 2018. Analysts traced them to a group Microsoft has nicknamed Strontium, which is closely tracked by every major threat intelligence company and is widely accepted to be run by the GRU, Russia’s military intelligence agency. Suvorov, Viktor (1984). Inside Soviet Military Intelligence. Suvorov, Viktor (1986). Inside the Aquarium. Suvorov, Viktor (1988). Spetsnaz: The Inside Story of the Soviet Special Forces. A Blog about the GRU's history, organization, operations, etc.